On a dark afternoon in July. Hestskjær Lighthouse under refurbishing sure looks like something out of another world as we pass it on our way south with the Coastal Express MS Nordkapp. 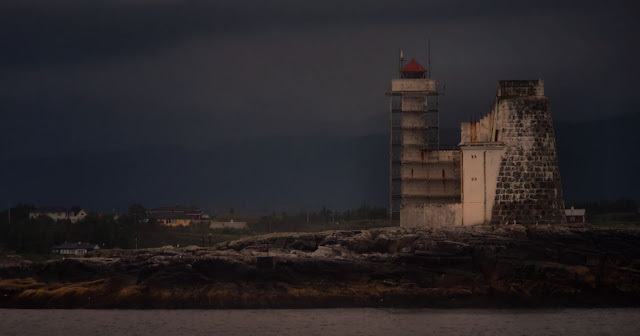 Hestskjær Lighthouse is a coastal lighthouse located in Averøy Municipality in Møre og Romsdal county, Norway. It is located on a small island about 2 kilometres (1.2 mi) north of the village of Langøy. The lighthouse was established in 1879 and automated in 1986. The 21-metre (69 ft) tall lighthouse emits a white, red, or green light (depending on direction) occulting twice every 8 seconds. The tower is a round, cylindrical tower that is white with a red top. The 28,200 candela light can be seen for up to 15 nautical miles (28 km; 17 mi). On 13 February 1944, the two ships SS Irma and SS Henry were sunk near Hestskjær.